Akachukwu (alias Joe Dickson) before Justice J.K. Hundred and Sixty American U S Dollars ($5,260). hoodwinked his victims by establishing a romantic relationship which according to him, will lead to marriage. In view of his pleas, the prosecution counsel, R.E. Alao asked the court to fix a date for trial. 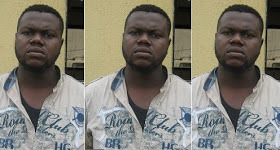 0 Response to "Yahoo Yahoo Boy Arrested For Defrauding US Lady Of $5,260 On Facebook"